The expressions of the Feminine aspect of the Merkabah, the Density Field of the Merkabah, is embodied solely by the notorious Metatron’s Cube. The expressions of the Masculine aspect of the Merkabah, known as the Auroric Field of the Merkabah (aka the Rasha Body) hasn’t been promulgated on Earth until now since we’re on our way in ascending to the 4th and 5th Dimensional Densities of Harmonic Universe 2 within Outer Creation along with the Zero-Point Source Energies in the 6th to 8th Dimensional Densities of the Gaia Sa Nuy Dark Matter Matrix (HU6) celebrating the conclusion of the evolutionary game of Polarity Integration that has been going on since life began within this Universal Time Matrix. Humans that are becoming Ascended Masters from the Ruby Order Melchizedek Collective along with the original Emerald, Gold, and Amethyst Orders will be able to augment and/or control Dark Matter with their integrated Light Body and have the ability to travel to up to 768 new Veca Universes and up to 3072 new 15D Universal Time Matrices sourced from Dark Matter. The geometric depiction of the Auroric Field Merkabah was discovered by my friend Tae Seol. When he first showed it to me I immediately recognized its significance and thus began my investigation on this figure. Now I would like to elaborate on our discovery by offering my analysis on what I would like to call the “Hyperpyracube”. The first order of business is to describe the stellation of this 2D figure in 3D. Obviously the outermost square depicts a cube and the outermost circle depicts a sphere. For the 2nd outermost square that’s tilted and the horizontal and vertical lines cutting across it diagonally, they form an octahedron where its vertices touch both the outermost cube and sphere as depicted in figure B. Next are the 4 outermost acute isosceles triangles originating from the corners of the outermost square that end at the corners of the 2nd outermost square that’s tilted. In 3D they are actually pyramids where their apex are located at the middle of the outermost cube’s 4 Z-axis edges and the 4 vertices of each base of the pyramid are at the 4 farthest opposite midpoints of the edges of the outermost cube making it a total of 4 pyramids. Note that the vertices of the 2nd outermost cube are not located on the same plane as the corners of the 2nd outermost square but on the corners of the innermost tilted black square as depicted in figure A. This is because the 2nd outermost cube is formed by the pyramids intersecting with one another. The same formation of pyramids applies to the x and y axis of the outermost cube as well. This means that there are a total of 3 2nd outermost cubes that overlap each other. They form a 3-compound cube exhibiting octahedral symmetry known as ‘Escher’s compound‘, depicted in figure C. The convex hull of this polyhedron is a non-uniform truncated octahedron which happens to be the permutohedron of the 4th order Tesseract Hypercube that exists within the Hyperpyracube WHICH IS EXTREMELY SIGNIFICANT! I will reveal why that’s the case later in the article. 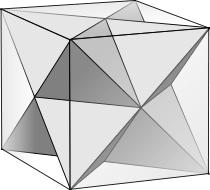 Figure C: A Compound of 3 Cubes With Octahedral Symmetry (Escher’s Compound). 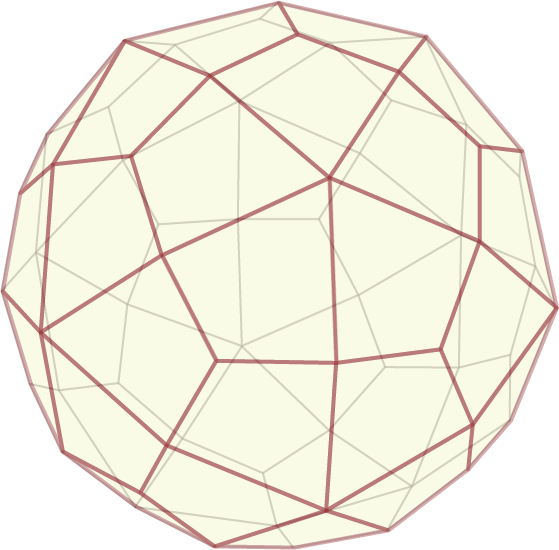 The mesh of this polyhedron can be expressed with 67 cells as discovered by Ronald K. Hoeflin in 1985. Next are the 4 isosceles triangles originating from the middle of the edges of the outermost square where the base of the triangle connects to the corners of the innermost square. They yield 6 pyramids after all 3 axises are considered where their apex are located at the center of each face of the outermost cube and the 4 vertices of each base are the 4 vertices of the inner Hyperpyracube closest to the apex. Then there are the 4 isosceles triangles inside the 4 outermost isosceles triangles originating from the corners of the outermost square. They yield 12 pyramids after all 3 axises are considered where their apex are located at the middle of each edge of the outermost cube and the base of each pyramid forms a diagonal cross-section of the inner Hyperpyracube. And finally there are the 2 diagonal lines in the outermost square. They are the 8 lines that connect the opposite vertices between the inner and outer Hyperpyracubes like in a 4D Tessaract Hypercube. Now let’s discuss the geometric functionality of the Hyperpyracube. Within Outer Creation, Metatron’s Cube corresponds to the Density Field of the Merkabah in both HU1 and HU2 and when it’s in the drivers seat it rotates the Merkabah in one directional angle (34 CCW / 21 CW). The Hyperpyracube corresponds to the Auroric Field of the Merkabah in HU2/HU6 and when it takes the drivers seat it directs the rotation of the Merkabah in the opposite directional angle (331/3 CW / 112/3 CCW). 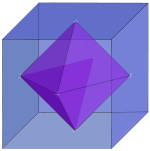 The Merkabah generates a magnetic field known as a torus field within the edges of the cube as depicted in figures D and E. The inner cube of the Hyperpyracube embodies the physical body of the soul and the outer cube embodies the surrounding outer light projection of the soul such as a planet, star, galaxy, or spaceship. There are 3 stages in the Starfire Ascension Cycle: Stage-1 known as ‘The Glide’, Stage-2 known as ‘The Slide’, and Stage-3 known as ‘The Span’. Angelic Humans that have yet to become Ascended Masters will ascend to the level that will allow them to integrate with their Light Body which is the outermost, surface radiation layers of our multidimensional anatomy; the Density 2 Alphi Hova Body and perhaps the Density 3 Betcha Hova Body in Divine Timing. The Density 4 Mahara Hova Body, Density 5 Raja Hova Body, and the 3 Yuseta Hova Bodies are now obsolete with respect to the majority of the Hue-man Angelic Race (especially those originating from the Ruby Order) since all God-Source Energy from the Yunasai Matrix has dimensionalized into the I’a Sa Nuy Dark Matter Matrix. We will then have the ability to transmit portions of our conscious awareness to our Hyperpyracube/Rasha Body during Stage-1 of the cycle, where the Hyperpyracube at its unsolidified non-Merkabah state is the structure of the Rasha Body in Outer Creation known as the RashaLAe Body. It would first require the activation of portions of their personal Rasha Dark-Matter Body serving as a template upon which the outer Light Body and physical-matter body forms. Prior to the commencement of the Starfire Ascension Cycle, the simple projection dynamics use as the ‘projection vehicle’ specific portions of the personal anatomy from the Light Body as opposed to that of the more adept Rasha Body, allowing for the Rasha Body to project across all 4 domains of Creation (Inner, Middle, Outer, and Core) within a 15D Universal Time Matrix as opposed to within a single domain that the Light Body is confined to. During the Slide, a portion of the physical-atomic body quantum literally changes state and transfers with the corresponding portion of its respective conscious awareness within the Rasha Body for projectional travel to a remote location. It involves a temporary condition of either physical-atomic bi-location or translocation. This transitional state of the Rasha Body embodies Stage-2 of the Ascension Cycle. During the Span, if an individual has evolved into becoming a Mashayah, their Rasha Body would consciously and physically/atomically be able to relocate to any location within the Cosmos limited to the worlds that their Ascended Master gestalt identity is confined to, completing Stage-3 of the Ascension Cycle. In order for the ascension/translocation to occur, in Stage-1 the Merkabah while under the control of the Masculine Auroric Field would have to first start rotating after it releases itself from phase-lock and abandon its stationary state as a permutohedron convex hull (the non-uniform truncated octahedron) and exhibit itself as the Hyperpyracube/Rasha Body. The Feminine Density Field would then take over the Merkabah and rotate in the opposite direction after it abandons its stationary state as an octahedron enveloped within the Hyperpyracube. The Auroric Field would then direct the rotation of the soul’s inner half of the Hyperpyracube and the outer projection’s outer half while utilizing the Rasha Body’s Dark Matter to transform its physical body and outer projection. They would then relay their conscious awareness pertinent to the Rasha Body in order for it to begin the process of transfiguring itself. If a soul qualifies for Stage-2, then they’ve reached ‘one-quarter to one-half quantum point’ of atomic transmutation/transfiguration and it would then ascend by allowing the polyhedron grid exhibited by the outer cube of the location that’s connected to the soul’s inner cube to transform into the grid of the new outer projection as the soul projects itself by way of its consciousness. As the two cubes of the Hyperpyracube rotate during this temporary bi-location/translocation process, its consciousness is aware of both locations simultaneously. If the soul qualifies for Stage-3, then they’ve reached the ‘full quantum point’ of atomic transmutation/transfiguration and can enter the Krystar State of full Ascension, from which one can return to manifestation within the personal eternal-life ‘Mashayanic Body’. In order for the Merkabah to recover its physical form and suppress its functionality of ascension/translocation, the Density Field would first have to return to its octahedron state and the Auroric Field would then envelop the Density Field’s octahedron and re-engage into a newly phase-locked permutohedron state manifested by the new convex hull. This is how the Hyperpyracube facilitates the process of “traveling within hyperspace” and why the Hyperpyracube and its geometric derivations are of paramount importance. Time is nothing more than the 4th dimension of space within the space-time continuum. HU1 solid matter is carbon based. All HU1 solid matter requires carbon in one way or another whether it be planets, human bodies, or meteorites. HU2 light matter is silica based. HU1 density field solid matter without its HU2 light matter counterpart can only traverse across time in a linear trajectory. HU2 light matter with or without its HU1 solid matter counterpart traverses across time and space without being bound to any linear trajectory. This is why the HU2 Auroric Field Merkabah is necessary in order for dense matter to be able to bi-locate/teleport. As part of the Order of Melchizedek experiment, the Hyperpyracube was slated to fractically expand in order to allow more souls to ascend into becoming Ascended Masters and attain the level of spiritual mastery that used to be exclusive to the limited number of Ascended Masters that existed in the past. This was accomplished by the fractal unfolding of the Hypercube in the Hyperpyracube. In 3D, unfolding a Hypercube results in the formation of a Hypercross consisting of 7 cubes in the inner position and one cube in the outer position that encapsulates the 7 inner cubes. This fractal expansion process can theoretically be repeated iteratively inwards and/or outwards to no limit. An example of how the Hypercross looks like in 3D is the arbitrary 2 level deep formation depicted in figure E. Figure F and figure G are depictions of the isometric projection of the Hyperpyracube network known as a Fractal Hexagon. For the evolution of the Melchizedek God-Seed soul atom, the expansion was directed inwards as the innermost cubes spawn 7 new cubes inside themselves forming a cross after each level of dimensional expansion. Within our Melchizedek God-Seed 15D Universal Time Matrix, the Hyperpyracube Hypercross was expanded 13 levels deep (once for each dimensional frequency from the 14D down to the 2D excluding the 15D and 1D since 15D is the consciousness of the ETERNAL KRYST who has unrestricted free will and because 1D isn’t capable of exhibiting free will consciousness as the subconscious mind root chakra. Each Hyperpyracube will embody one of the 6,920,643,604 ((1 * 7^12 / 2) + 4) souls that will eventually integrate with the majority of the humans on this planet over the course of the next 70 years once they incarnate on 5D Earth and ascend. The innermost cubes of the Hyperpyracube Hypercross network were embodied by Father Melchizedek the ETERNAL KRYST up till now and the outermost cube by Sunat Hunab Kumara (aka Sanat Kumara) who is the Planetary Logos of Earth. The innermost cubes will now be embodied by Ascended Master Maitreya and the outermost cube by Ascended Master Sananda. Ascended Master Kuthumi will embody the cube that can freely traverse itself across the entire network. Now I’ll present the polyhedrons exhibited by Metatron’s cube and the Hyperpyracube belonging to the Melchizedek God-Seed Angelic Soul along with their dimensional vibration frequency rates and responsibilities.